A BRITISH tourist has gone ape after a monkey attacked him at a Spanish zoo. 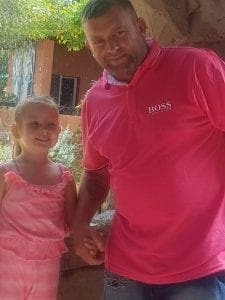 Glenn Hackles, 38, from Swansea, swung out after his holiday was ruined when he was rushed to hospital following the attack. 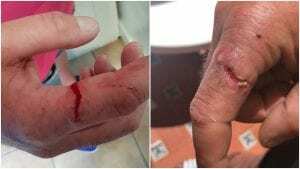 He slammed Selwo Marina, in Benalmadena, after the primate swooped down from a tree during a tour through a squirrel monkey enclosure and bit him. “It had teeth like Stanley blades,” he told the Olive Press. “There was blood everywhere,” added his partner, Danielle Ward, 28, who was furious that the guide simply got on with the tour. “That was despite Glenn and our three-year-old daughter screaming,” she said. The family, who have been coming on holiday to the Costa del Sol for 20 years, are now demanding answers from the zoo. “We were walking along a path when I saw it flying down from a tree on the right, I moved my daughter just in the nick of time,” added Ward. The pair are angry that the tour guide failed to give him assistance, despite the wound being so deep you could see the bone. “The tour guide only opened the gate when we shouted at her for first aid, then she turned her back and carried on,” Ward continued. The group were merely pointed to an information desk where they were handed a first aid kit and had to dress the wound themselves. 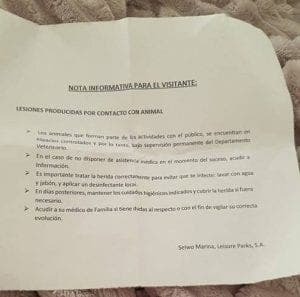 Ward said the family were asked to sign a document and an incident book in Spanish at Selwo Marina and although an assistant attempted to translate it she could not fully understand. Hackles has now flown back to Wales, where he is set to get further treatment on the badly infected finger. The telecoms engineer was even unable to start a new job on his return home. Although they received a full ticket refund and the taxi fare to the hospital – the family was left to pay for yet another taxi to take them to a different hospital for further treatment. They have since been to the police station but were told they could not report the incident, as they were awaiting a hospital report to send to Selwo Marina. “They really need to deal with this matter. It could be a child next time,” added Ward, who said her daughter, Billie-Marie, has been having nightmares since. A spokeswoman from Selwo Marina said: “It was a small isolated incident. 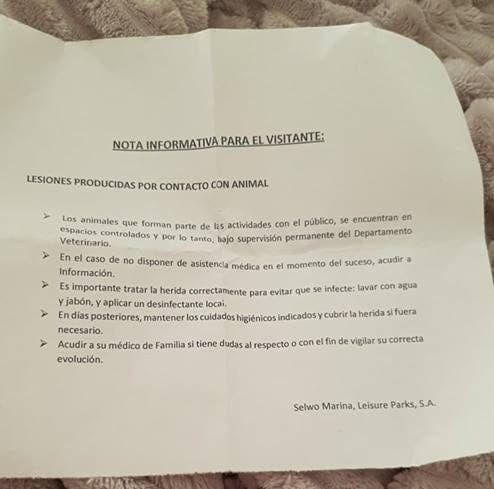 “There is information in all our areas advising how to treat the animals and everybody is to follow the rules.